On May 8, 2018, the Democratic Republic of Congo's health minister declared an outbreak of Ebola, the highly deadly disease that killed more than 11,000 people in West Africa between 2014 and 2016. The first cases were reported in the remote town of Bikoro, in northwestern Equateur province. However, by early June three out of four confirmed Ebola patients have died in Mbandaka, the Equateur provincial capital, a city of more than 1 million and a transport hub to Congo's capital, Kinshasa. The World Health Organization (WHO) called news of Ebola's spread to Mbandaka a "game-changer" that makes the risk of an international spread of the disease "particularly high." As of late May, 55 cases had been reported, of which 37 have been confirmed. Twenty-five people have died so far; 12 deaths are directly attributed to Ebola. As the 2014 outbreak showed, Ebola can spread rapidly when no adequate measures are taken to contain it. A lack of information about the virus, cultural practices such as ritual washing of bodies before burial, and a lack of adequate protective equipment for health workers can facilitate the virus' spread. The International Covenant on Economic, Social and Cultural Rights, which Congo ratified in 1976, recognizes that everyone has the right to the highest attainable standard of health. Governments are obligated to take effective steps for the "prevention, treatment and control of epidemic, endemic, occupational and other diseases." This includes containing the outbreak, providing protections to people who are at especially high risk of contracting the virus, and ensuring adequate treatment to those who contract the disease. Any measures taken to protect the population from the virus that limit people's rights and freedoms, such as quarantines, must be lawful, necessary, and proportionate. While the Congolese government is the primary guarantor of human rights in the country, the international community has an important role to play "through international assistance and co-operation." Placing the burden on the government alone to address the obstacles to the fulfillment of the right to health would be to ignore the political and economic difficulties that the country faces. Despite an abundance of natural resources, Congo is one of the poorest countries in the world, with weak infrastructure, poor governance, and widespread corruption without accountability. To promote the right to health, the United Nations Committee on Economic, Social and Cultural Rights (CESCR) and the special rapporteur on the right to health have observed that, "States should ensure that their actions as members of international organizations take due account of the right to health." The committee also has determined that "international assistance and cooperation, especially economic and technical," should enable developing countries to fulfill their core and other obligations. The special rapporteur has indicated that governments should pay particular attention to helping other countries achieve minimum essential levels of health. After the outbreak of the Ebola crisis in West Africa in 2014, the governments of Guinea, Liberia, and Sierra Leone all imposed quarantines, restricting people's rights to liberty and freedom of movement as well as their livelihoods and access to health care and other rights. The quarantines were imposed on individual houses, neighborhoods, villages, and, in a few cases, entire administrative districts. Social mobilization efforts that expand understanding of Ebola and appeals for voluntary limits on movement combined with social support - including home-based care and food aid - can be as effective as measures that restrict rights and can be achieved through community engagement and attention to the special needs of disadvantaged groups. Congo and its international partners should ensure that people have access to health information and care and should restrict liberty or movement only if and when absolutely needed and with the protections outlined under international human rights law. As part of government's obligation to take all necessary steps for the "prevention, treatment and control of epidemic ... diseases," the International Covenant on Economic, Social and Cultural Rights regards as a "core obligation" providing "education and access to information concerning the main health problems in the community, including methods of preventing and controlling them." The Congolese government and international partners should step up support for groups engaging in public health education. In 2014, fear of Ebola also led to attacks on health workers. 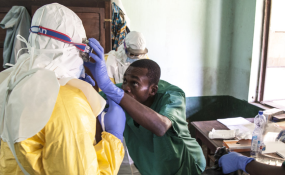 In April 2014, an angry crowd attacked an Ebola treatment center in Macenta, 425 kilometers southeast of Guinea's capital, Conakry, run by Doctors Without Borders (Medecins Sans Frontieres or MSF), which it accused of bringing Ebola to the city. In August 2014, people in N'Zérékoré, Guinea's second largest city, protested spraying a market with disinfectant that they believed was infected with the Ebola virus and rioted, injuring over 50 people, including security forces. Law enforcement agencies in Congo should ensure that they can quickly, adequately, and appropriately respond if similar attacks occur. In the 2014 Ebola epidemic and earlier outbreaks, women had greater exposure to the virus and were thus at greater risk of becoming ill. The higher exposure rate among women appears to have been the result of the roles women traditionally or disproportionately occupy - including cross-border traders, health workers, and traditional birth attendants - which put them at greater risk of coming into contact with the virus. Furthermore, women more often cared for the sick and in the case of death, traditionally wash and prepare a body for burial. The government of Congo and international partners responding to the crisis need to ensure that prevention efforts address the particular vulnerability of women, that women are able to get information about how to prevent and respond to the epidemic, that any obstacles to obtaining care - including financial and cultural - are removed, and that they are engaged at the community and national level in shaping the response to the crisis. If Congo institutes emergency measures that restrict basic rights and freedoms - including freedom of association, assembly, and movement -, as Guinea, Liberia and Sierra Leone each did in 2014, the government should ensure that restrictions on public health or public emergency grounds meet the requirements of legality, evidence-based necessity, and proportionality. Any restrictions should be clearly defined, well publicized, and subject to monitoring through public hearings before the Congolese parliament, by the national human rights commission, and by independent groups operating without unnecessary restrictions. Over the past three years, the Congolese government has brutally repressed dissent and curtailed basic civil and political rights as President Joseph Kabila has remained in power beyond the end of his constitutionally mandated two-term limit. Security forces have killed more than 300 people during largely peaceful protests since 2015 and arrested hundreds of others, while the government has cracked down on media and civil society groups. The government should not use the Ebola crisis as a pretext to further clamp down on people's fundamental rights. To enhance public confidence in the Ebola response, the government should ensure transparency in the receipt and use of donations and other assistance. In 2014, Sierra Leone initially made a meaningful effort to do this by creating an Emergency Operations Center (EOC), which centralized donations, regularly published lists of donations received, and independently monitored the EOC's "Ebola Account." However, subsequent studies concluded that major corruption concerns marred the Ebola response.